Pizza … Boomerang??? Are they really “rewards” if you charge me extra for them??? Tagged with: pet peeves • puppy! Wanna know one of the more obnoxious ways of being woken up in my house? 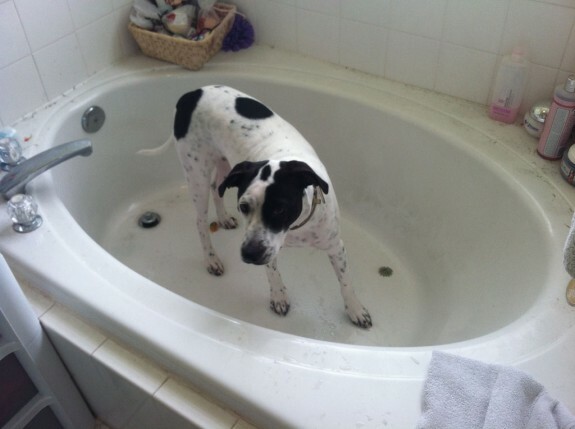 How about finding that your dog has gotten herself into the bathtub and now can’t get back out again?! Go figure, this is the one puppy that not only doesn’t fear baths like any good, god-fearing dog should, but actually looks forward to them to the point of begging at the side of the tub for us to let her play in the water.